Sam and Dean get hit with a spell that sticks them in each other’s body, but it’s only supposed to last a couple of days, so they figure they can just ride it out. What’s the worst that could happen? At first, they’re a bit awkward getting used to the feel of a different body–and the weirdness of seeing their own face looking back at them with their brother’s facial expressions. But as time passes, Dean becomes more and more aware that something is off with Sam’s body. There’s a hunger, a craving, that he just can’t place, and the big, unhealthy meals that he loves just seem to make him feel worse. . . . Thicker Than Water was a very enjoyable and thought-provoking SPN fanfic. The premise is just fabulous–both the body-swap itself, and the use of that to force Dean to see the whole demon-blood addiction thing from Sam’s perspective. I loved how well the author wrote the whole family/bromance thing that the boys have while still highlighting their differences and being honest about how much they keep from each other. Because really. Major kudos to the author for writing a third-person, present-tense story that not only doesn’t feel stilted and awkward but actually has a great flow and feels really natural to read. It’s rare to see present tense written with any kind of skill, so I found this particularly impressive. I also liked how much the phrasings and mood of the story feel like both the show in general and Dean in particular (since it’s mostly from his perspective)–including the use of concepts like seeing one’s face in a mirror with a bitchface filter. Well written and very credibly Dean. I enjoyed Thicker Than Water a lot and look forward to reading more of the author’s work. You can find Thicker Than Water at https://www.fanfiction.net/s/6266954/1/Thicker-Than-Water. The great thing–the scary thing–about boxes is that they can contain just about anything. Or nothing. You’ll never know until you open them. It could be something that will change your perspective for the better. Or it could be something that will wreak havoc with your life. Maybe it’s an opportunity for a second chance. But then, maybe it’s best left closed–after all, once you’ve imagined all the things it could be, perhaps whatever it really is might be a disappointment. You never know. . . .
As with Kibuishi’s other Explorer books, The Mystery Boxes is a collection of graphic short stories by various authors/artists focusing on a theme–in this instance, boxes. You’ve got quite the gamut of stories here from creepy (“Under the Floorboards” in which a wax doll tries to take over a little girl’s life), to corny (“Whatzit” in which a weird alien kid is pranked and returns the favor), to moving (notably “The Keeper’s Treasure” and Kibuishi’s own story, “The Escape Option”). Honestly, my opinions about these stories range widely, with some of them being lots of fun and others just being kind of “huh?” for me. Some of them, I just don’t quite get what the author was getting at, I guess. But then, there are stories like “The Keeper’s Treasure,” “Spring Cleaning” (goofy but amusing), and “The Escape Option” that I think still make Explorer: The Mystery Boxes well worth the time to read it. Accomplished grifter Sarah Manning walks into the train station and witnesses the suicide of a woman who looks exactly like Sarah herself. Both curious and ready to take advantage of the situation, Sarah assumes the identity of the woman, Beth Childs, with the help of her foster-brother Felix. What follows is a whirlwind of monumental proportions as Sarah discovers that she is but one of many clones. Meeting her newfound “sisters” is just the beginning as they face their own dark past, those in the present who would destroy or manipulate them, a defect built into their own DNA that is slowly killing them, not to mention being completely unsure who to trust. But at the same time, they discover a new family and a strength in each other to help them face the maelstrom with defiance as they choose their own ways to live. Orphan Black is one of those shows that, as incredible as it sounds at first, delivers so much more than it initially promises. It’s really quite amazing. Well, Tatiana Maslany is amazing, that’s for sure. She manages to pull off multiple clones with distinct styles, mannerisms, personalities, etc. and keep them all unique–sometimes with multiples of them in the same room conversing and even physically interacting with each other. Her grasp of each of the characters is incredible–to the point where you can even tell where one sister is pretending to be another sister by super-tiny but well-realized tells. Maslany’s acting in this series truly blows me away! Not to mention the sheer cinematography required to pull off some of the scenes; it’s seamless and beautiful. The characters are great as well–thoroughly developed with uncertainties and flaws and emotional subtlety and moral ambiguity and all the complexities that make people truly human. You’ve got a ton of diversity, even just among the clones, too. And the other characters are brilliantly cast and played as well. Felix is quite possibly my favorite character in the whole show; he’s the heart and the artist, the home-like softer side of things, which is kind of hilarious since he tries so hard to be defiant and brash. I love him, though. And Siobhan, Sarah and Felix’s foster-mother–all the mystery and protectiveness in her character is fabulous! As for the plot, well, again it’s so much more than we are initially promised at the beginning. I mean, you start out with a girl taking over the life of a cop who looks like her, encountering a couple other girls who claim to be her clones, dealing with trying to be a mom to her daughter–intense stuff for sure, but fairly contained and small-scale. But by the end of it, you’ve got decades-long, multinational plots and huge, interconnected organizations and hundreds of clones and major life-or-death situations. It’s all pretty overwhelming and hard to keep track of, to be honest–the main reason I can’t give this a full 5 of 5 rating, actually. Still, it all ties up better than I expected by the end, and the conclusion was enough to make me cry but also be quite satisfying. 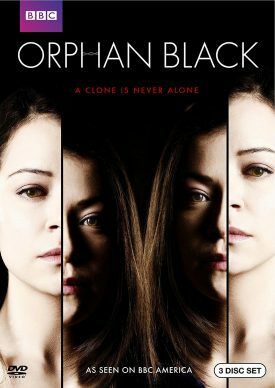 This show is definitely not for the faint of heart and is only for a mature, adult audience, but I would still highly recommend Orphan Black for many, many reasons. It’s a great show that I will enjoy re-watching many times over. Recently, Castiel has been feeling the restrictions of being an angel cooped up in a human’s body. It’s making him grumpy and short, even with the guy he (not so) secretly loves. Really, Cas desperately needs a chance to spread his wings, just for a while . . . but there are all sorts of complications that make that less than practicable. Lucky him, Sam and Dean think they might have a solution–assuming it actually works. So, I was in the mood for some Supernatural stuff (which, on a side-note, sorry for totally spamming SPN right now), and I found this adorable little fanfic. It’s mostly a happy and fluffy means to a cute Destiel end, despite the issues presented with Cas’s vessel and the complications of the spellwork the boys have to go through to make things work. I feel like the author captured the characters well, and I enjoyed the overall tone of the story. The concept was interesting too; in canon SPN, we get so little of what’s going on in Cas’s mind at any given time that it’s nice to see that explored more. Plus, the development of the relationship between Dean and Castiel was tasteful and convincing. On the downside, there were some mild grammatical issues, but then, it’s nearly impossible to find fanfiction without that. More outstanding was that the author has a bad tendency toward certain sentence structures which, while great for adding color and variety to writing, become kind of repetitive when used all over the place. Still, this was a fun story which I enjoyed, and I’ll probably read more of the author’s work. Note: You can find this story at https://www.fanfiction.net/s/12383537/1/Restricted. On a side note, it’s been ages since I’ve read fanfic at all, but recently I’ve just been in the mood for more stories about the characters I love. I’ve found some pretty good ones, too. So I may be including some more reviews (which will be clearly labeled, so you can skip them if desired)–mostly SPN, Merlin, Doctor Who . . . possibly some Superwholock if I can find some good ones (the concept does fascinate me). Anyhow, point being that I’m planning to include these as Media Reviews and stick review links on my Media Room . . . yeah.